If you do not wish to vote at this time, click here to visit MafiaHeroes stats. 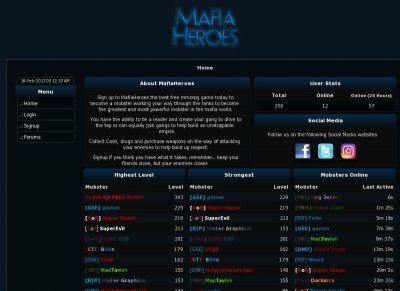 Sign up to MafiaHeroes the best free mmorpg game today to become a mobster working your way through the ranks to become the greatest and most powerful mobster in the mafia world. You have the ability to be a leader and create your gang to drive to the top or can equally join gangs to help build an unstoppable empire. Collect Cash, drugs and purchase weapons on the way of attacking your enemies to help build up respect. Signup if you think you have what it takes. remember... keep your friends close, but your enemies closer.